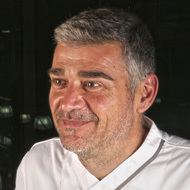 From the Balearic Islands in Spain, Baltasar Massot has developed an extensive career in pastry shops in Mallorca and even in great hotels in Kuwait. His last destination has been the Pastry School of Barcelona (EPGB) where he has been teaching for about 10 years. Aware of the rich pastry tradition in those islands, he has managed to adapt and modernize it through the use of technological ingredients and also contributing his personal artistic vision in which his talent with handling chocolate and other typically pastry materials stands out.